As the Duchess of York, Sarah Ferguson, will testify, toes can get you into all sorts of trouble. Put them in the wrong place and the whole world wants to know about it. However, one toe-based activity has the ability to stigmatise like no other. A reputation-tarnisher on a par with facial tattoos and fancying your sister. This heinous activity, dear reader, is toe-poking. Ah, the toe-poke. Not since Jaws reared his pointy head above the shallow New England waters has such a beautiful creature been so cruelly misunderstood. 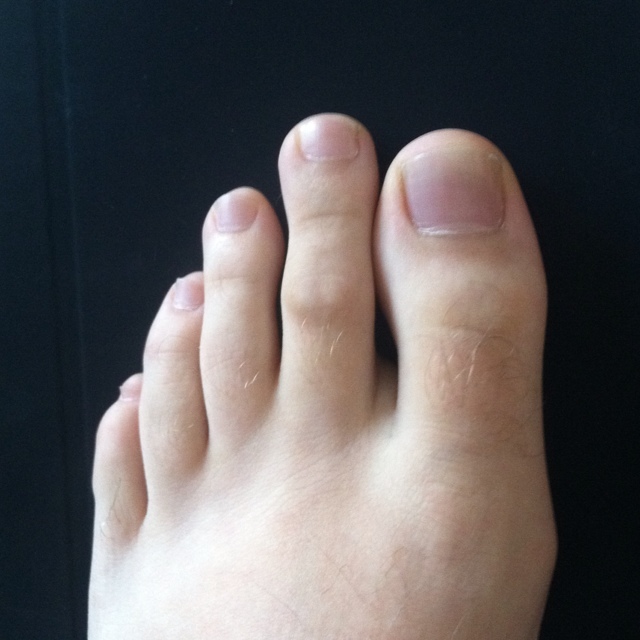 Allowing for community variation, you may identify this contemptible being as the toe punt, the toe bang or even the toe bung. But you all know what I mean. Those nasty little prods with the toe. You may even have abused a football yourself in such an errant manner. Perhaps during a misspent youth; somewhere in between stealing Lego bricks from playschool and that first cigarette. Wash yourself all you like, my child – the dirt won’t come off. Some people argue that toe-poking is genetic. Natural, even. And that we ought not to pass judgment. “Nonsense” screams the moral majority. These deviant souls must be cured. “Kick with your laces, boy!” Self-help groups have even been set up in order to rid you or, god forbid, a loved one of this terrible affliction. A boy at our school suffered badly from this ‘disease’. Jamie Palmer, or “Podger”, as he was affectionately known, was a toe-poker of the highest order. He’d lurk near the opposition goal just waiting to stick the tip of a Clarke’s size 3 on the end of something. Reviled by juniors and infants alike, Podger was shunned for his ball-striking heresy. It was the playground equivalent of voting BNP. Some people say that taking heroin is the greatest feeling of warmth and security that you could ever know. A practice that, while horrifying and ultimately life-threatening, envelops you in such joy that, deep down, you know you’ll never be able to let go of the needle. I imagine Podger experienced a similar sensation when putting toe on leather. Despite forming a one-man underclass throughout his days at Brooklands County Primary School, Podger just couldn’t stop. Toe poking was in his blood. This was his way of life. He hadn’t chosen it. The life had chosen him. I couldn’t tell you where Podger is now but I can only assume that he is, at best, a fringe member of society. A social leper. An outcast who could not, and would not, subscribe to social norms. Call him a progressive, but Old Man Too Good never forced me down this narrow-minded path of thinking. He didn’t see toe-poking as the act of a cloven-hoofed Beelzebub. Indeed, Father and I would nod approvingly at such egregious use of the toe (only ever in furtive tones, you understand) when it displayed itself on The Big Match Live. Like ladyboys and cloud computing, we knew that toe-poking would never gain the public’s full acceptance or understanding. But there was something poetic in witnessing its implementation. On Sunday afternoons we would watch John Barnes, using the skill of a painter and the strength of a rhino, burst through massed ranks of defence in a majestic flurry. Barnes would beat one man, then another. Some days even a third. Thenceforward, the wizard of the Liverpool wing would roll the ball sideways to his strike partner, Ian Rush, who would toe-poke it into the net from seven yards. A shy smile would break out on Barnesy’s face as he casually jogged back to the halfway line, pleased at a job well done. Rush, on the other hand, would sprint away in jubilant ecstasy; punching the sky as though one of his blog articles had just gotten a hundred readers for the very first time. He would hare towards the Anfield faithful who, in turn, roared with delight – their master finisher had done it again! For those of you I might be able to persuade on the issue, Ian Rush provided us with 382 bloody good reasons why the toe-poke is viable. It’s a bona fide option, especially in the penalty area. A toe-poke requires almost no back-lift and it’s easy to change the direction of the strike. Ask any goalkeeper what they fear most and nine times out of ten they will tell you it’s a poke from short range. Anticipation is everything for those crazy custodians and you just can’t read a toe-end. It’s the most disguised shot in the book. The scoundrel of the vineyard. Toe-poking is the same. If you’re at the back end of long hour of 5-a-side after a night out on the tiles, you’ve reached for the toe-poke and don’t pretend you haven’t. You want your toe on that ball. You need your toe on that ball. You want the truth? You can’t handle the truth. Finding a decent top flight toe-poker is as rare as hen’s teeth these days. The golden age has passed. It didn’t stop at Ian Rush and Gary Linker. There were a few more toe-pokers hewn from the same sneaky timber. Robbie Fowler, Kevin Phillips, Michael Owen. Franny Jeffers for all of a season and a half. But eventually they all ebbed away in favour of the Rooneys and the van Persies. Players too headstrong and proud not to put at least some kind of spin on the ball. Nowadays it’s all insteps and the outside of the boot. The game belongs to the show ponies. Players who have too much in the way of swagger and commercial endorsements to stick a cheap toe in where it matters. There was a time when Gary Lineker used to wear out the front end of his boots. Now all he exhausts is our patience. Sir Gary was fondly remembered when he let his toes do the talking. Switching to a more traditional form of oratory on Match of the Day has been his downfall. Maybe part of the sadness in Gary’s Saturday night eyes is that he doesn’t see the next Gary Lineker out there on the extended highlights. The position he knew and mastered doesn’t exist anymore. He’s one of the last great calligraphers staring despondently at a myriad of font options on Microsoft Word. Every now and then, though, the modern game forgets itself. Once in a while, usually on the Monday night game, you see a crafty little toe-poke. A mid-level striker goes rogue and nudges a ball goal-wards with the forbidden article. He’ll probably get dropped for the next game. Certainly, Nike will have torn up his boot contract before the final whistle is even blown. But somewhere out there, deep beneath the orange tan and the self-satisfied expression, Gary Winston Lineker quietly smiles to himself. There’s still place in the game for a little Old World charm.